If we want to fight effectively against oppression and marginalization, we have to understand the social and political systems that produce and reproduce them, and know the tools that can be used to make changes. At the same time it is vital to maintain our enthusiasm and motivation in the long term so that we can continue to build, brick by brick, the kind of society we want to live in. The School of Public Life has launched this book series as part of its dedication to this mission. The books present personal stories that show the reality of activism and advocacy in today’s Hungary, together with all their joys, difficulties, and many pitfalls, always from the perspective of social and systemic disadvantage. The first book, Talk to us, not about us, published in 2015, presented activists, advocates and community leaders who experience some form of social disadvantage in their own lives — poverty, Roma ethnicity, autism, physical disability — and despite this, or perhaps because of it, decide to take up a public role working for change. This new volume introduces the life paths and experiences of women for whom political work is as important an activity as motherhood, or who engage in activism and advocacy concerning precisely the political aspects of motherhood. The personal is political. This is not only a famous feminist motto, but also a founding principle of the School of Public Life. We believe that personal life circumstances are fundamentally determined by current social and political environments, therefore social change is inextricably linked to personal change. We have to live as we would like our communities to be, but at the same time remember that our personal decisions are also determined by the power structures in that community. This approach helps us to recognize that we are not alone with our problems, and that others — often many others — are in a similar situation. If we don’t blame individuals — and thus not ourselves either — for the circumstances in which we find ourselves, and thus see that the problems are systemic, it’s much easier to deal with the challenges that face us. These insights form the basis of collective political action, which is the only way to achieve change in the frameworks that continually reproduce social disadvantages and privileges. 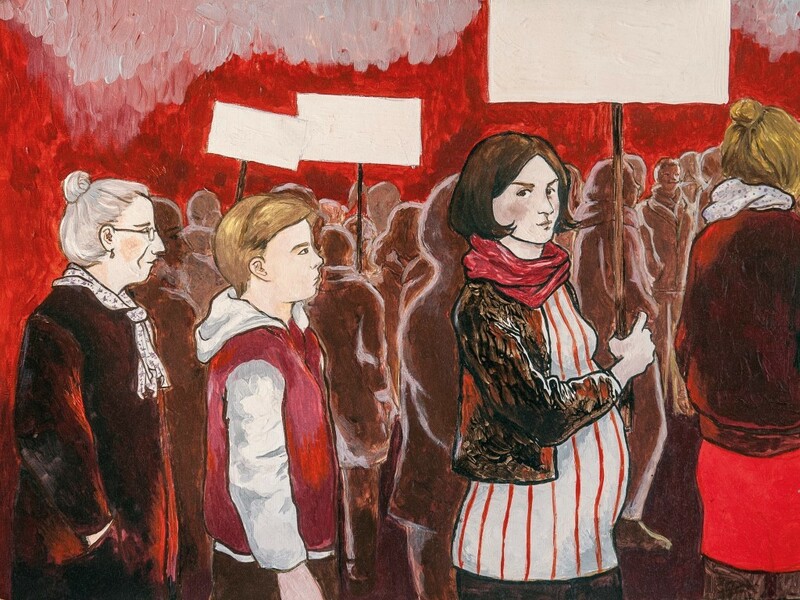 Mother stands up and speaks out shows how motherhood can be a huge obstacle to women playing an active role in public life, how such obstacles can be overcome and what activism means to the women involved. The book shows various models for combining the personal and the political, or for politicizing the personal. We hope that it can serve to inspire women and their partners who are simultaneously raising children and participating in political life, or to give tools to those who are considering parenthood but afraid that the realities of motherhood will isolate them from the community. We also hope it will help those in more privileged circumstances understand the situation of their contemporaries who cannot participate in activism as freely as they want. Hopefully it will help them to feel more empathy and solidarity with them, and to see them as partners in the fight for a more just society. What we emphatically did not want to do was join the large number of those who interpret women’s political activity purely in terms of their personal lives. That attitude is clearly discriminatory, as interviews with or portraits of male politicians, activists or advocates seldom mention their private lives. On the other hand we can’t ignore the fact that most child-rearing tasks still fall to women and even if the parents are in an equal relationship motherhood means a lot of extra work, and a lot of extra challenges for women who want to play an active role in their communities. This is not a private issue, it’s a political one – access to child welfare benefits, society’s attitude to children, and gender equality are all important questions that should be discussed. So let those directly concerned lead the discussion. In the course of doing the interviews for the book we noticed several important recurring themes. Perhaps the strongest one was sisterhood. The idea that women in any community are each other’s worst enemies is a myth. A very harmful myth, in fact, whose only function is to prove itself right and thus weaken women’s trust in each other and therefore the possibility of collective action. The life stories told in the book prove again and again that women are each other’s most important allies and supporters — whether they’re living in the same circumstances or completely different ones. They look after each other’s kids, they give each other advice, and they encourage each other with positive feedback. In comparison to the first book (which featured portraits of seven women and eight men), we were struck, as we put this one together, by how often the women mentioned other women they look up to and who they get support from. More than once an activist we had chosen to feature said that we should feature another woman rather than her, and that she would happily give up her place in the book to her. This points to another important theme that came up throughout the writing of this book: humility. The activists not only thought it a great honor to be nominated and selected for being featured in the book, but most of them also talked about their work with enormous modesty, and seized every opportunity to emphasize the role of the people who they were working with. Of course we know that women are taught to be modest, self-restrained, and humble at every stage of their lives — in the family, at school, in the workplace. That’s why it’s so important for women to become more assertive, to let their voices be heard, to express and defend their interests more vigorously. But at the same time humility is a really important virtue, and an essential quality in community work. Democratic processes cannot work without it, nor can we show effective solidarity with others — since the strongest (or loudest) always tend to suppress the others. We believe that women must learn to speak up, and men need to learn to listen. The third major theme that came up in the interviews was a realistic assessment of danger. Women emphasized over and over again that although they were very pleased to have been chosen, they were nervous about appearing in the book, or having details of their private lives revealed, or even having their community work written about; it required a thorough risk assessment on their part to work out if it they can afford being featured. There were some who concluded that they couldn’t risk it. This was a problem we hadn’t come across at all with the first book. It is clear that for women in today’s Hungary the choice to become politically active comes at a price. That is why it is so important to acknowledge the work of those who take up the challenge and show the way to others who may be deterred by the downsides. It is clear from the many life stories told in the book that when mothers decide to follow an activist path it is always as the result of a gradual consciousness-raising process. Nobody is born an activist mother. There are some who feel confident enough only after the birth of their fifth child. But these women demonstrate that confidence and public engagement can be learned – most often from other women’s experiences and advice. Or perhaps from reading the stories of the mothers in this book. This book contains sixteen portraits of activists and advocates who have forged their strength from their experiences — both negative and positive — as mothers. They are all working for a more just society where people like them can have better lives. The conversations range over childhoods and family backgrounds, the important stages in the path to becoming an adult, the joys and pitfalls of motherhood, the motivation for taking an active role in public life and the form they eventually chose, together with its relationship to their experience of motherhood; as well as their critical reflections on Hungarian society and their visions for the future. The narrative portraits are accompanied by the activist-photographer Gabriella Csoszo’s pictures, which she took especially for this book. Despite the difficulties and the obstacles in their way, their lives have been full of inspiration. We ourselves were taken aback a few times at the incredibly difficult circumstances they have had to overcome in order to do what they believed in. Central to the lives and work of every single one of these activists are commitment, resilience, self-criticism, empathy, and the faith in a better world. Every one of them is a conscious advocate: they know what they are fighting for, and also how they want to achieve it. Most of them work in community with others, because as mothers they know deep in their bones the necessity of paying attention to others, of cooperation, and of patience; and the strength that these can bring.